Land managers depend on quality fire research to advance their understanding of wildland fire behavior. 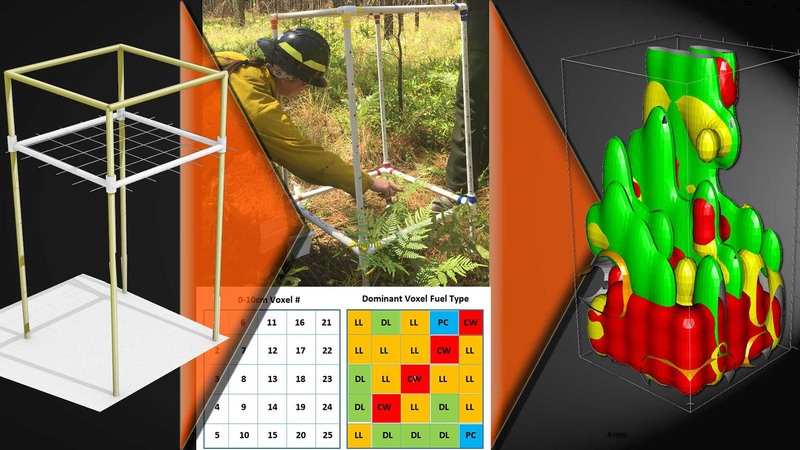 Cutting-edge fire behavior models output fire spread, fire intensity, and smoke plumes in three-dimensions, but forest fuels, which are used as model inputs, are not measured in similar dimensions. This research brings fuels to the forefront of fire ecology and fire science. Fuels, when measured appropriately, link fire behavior and forest response to fire – critical knowledge for frequently burned ecosystems. Wildland fire is a complex phenomenon that operates in three-dimensions (3D) and has feedbacks with vegetation, inherent vegetative fuels, ignition patterns, weather, and the atmosphere. Fire behavior models can capture these fire-atmospheric feedbacks in 3D, but the science of modeling fuels lags. Due to their spatial complexity, fuels are inherently difficult to measure and until now, simplified representations of fuels has been sufficient for 2D fire behavior models. In this book chapter, we discuss the importance of the ecology of fuels, how advances are being made to both measure and model forest fuels in 3D, and the significance of this for advancing fire ecology. We present a novel field sampling approach (see Image) for measuring understory vegetation and debris in 3D, which can be related to remote sensing instrumentation, such as terrestrial laser scanning and infrared video. Our goal is to develop a 3D fuel library across terrestrial US ecosystems using this new scalable field sampling approach and the latest remote sensing technology. This effort builds upon successful national fuel campaigns and would bring fire behavior modelers and land managers together through the ecology of fuels advances fire research, management, and operations.